If you like scenic views, waterfalls and nature, the 7 Cascades is a must. Literally meaning 'Seven Waterfalls', we have chosen to call our Restaurant & Lodges 7 Cascades, it being located in the near vicinity of the waterfalls. With its 11 waterfalls and 13 abseils, deep ponds, cliff jumps and surrounding lush green vegetation, the Tamarind Falls, 7 cascades, without no doubt, represent one of the most spectacular natural sites of Mauritius. Our Restaurant & Lodges are surrounded by luxuriant vegetation, lakes, rivers, waterfalls providing plenty of opportunities to experience nature like you never have before. 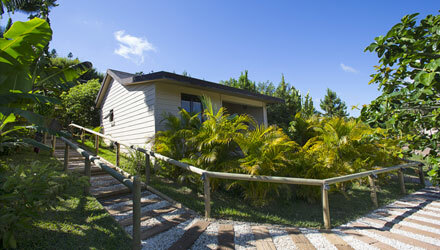 The Lodges are built to extend your feel of nature, peace and quiet; to provide you a comfortable retreat out of the everyday stress of life. Our welcoming team will be delighted to welcome you and through our local cuisine give you a taste of our local delicacies. 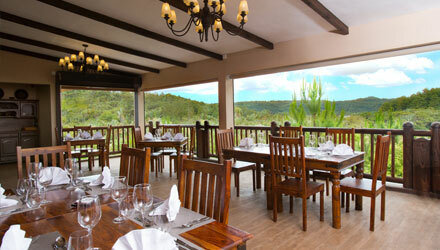 Our Main Restaurant area has an everyday capacity of 50 seatings. We also offer to cater for numerous functions such as weddings, birthdays, engagement parties etc... during which we can cater from 100 to 150 persons. 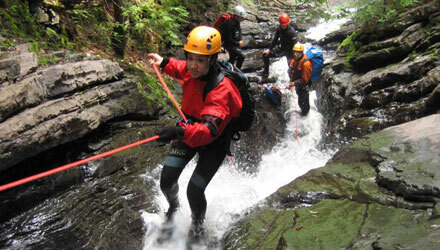 Our Main activity as the name of our domain suggests will be trekking and canyoning down the 7 cascades.